As school starts each year, there are consistently two types of drama that you can count on “middle school girl drama” and “flu shot drama”. Each fall a new crop of sixth grade girls start school unaware of “middle school girl drama”. For all those rising sixth graders who have not been adequately warned please listen carefully, “YOUR BEST FRIEND FROM ELEMENTARY SCHOOL WILL BECOME POSSESSED BY HORMONES. SHE WILL IGNORE YOU, LIE ABOUT YOU, RUIN YOUR REPUTATION AND THEN ATTEMPT TO BURN YOU AT THE STAKE”. Now with that out of the way lets focus on the other major form of predictable drama “flu shot drama”. Every year there is some controversy that creates drama. This year is no exception. This year there will be no Flumist. Yes, the painless nasal spray beloved by eight-year-olds everywhere is no longer being recommended. This summer the Center for Disease Control Committee on Immunization Practices made the recommendation that FluMist not be used this year. This vote came from data showing that flumist demonstrated poor performance in the last three flu seasons. While, it did seem that Flumist protected against some influenza strains it did not protect well against the major circulating strains. During the 2014-15 flu season H3N2 caused most cases of illness while H1N1 (swine flu) was the predominate strain in both 2013-14 and 2015-16. With these strains the Flumist was clearly inferior. Children who received the FluMist were almost 4 times more likely to get flu than those who received the flu shot. Strangely, this vaccine worked better during research trials and its first few years of licensure. While there are lots of theories, no one is sure why flumist has failed. So for this flu season … Would you like a flu shot or a flu shot? 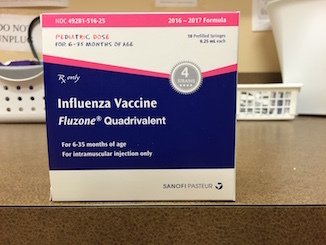 This season’s quadrivalent flu shots will protect against two influenza A strains and two B strains. The flu shot is an inactivated vaccine and approved for children 6 months and up. It is safe for children with asthma, pregnant women and close contacts of immunosuppressed individuals. Side effects include soreness, local reaction, and low grade fever. Children younger than 3 years old get a lesser “half-dose” (0.25 ml verses 0.5 ml for people 3 years and up). It takes two weeks after vaccination for the body’s immune response to fully respond and for you to be protected. Vaccinate early to get the most benefit. CDC recommends that people get a flu vaccine by the end of October.